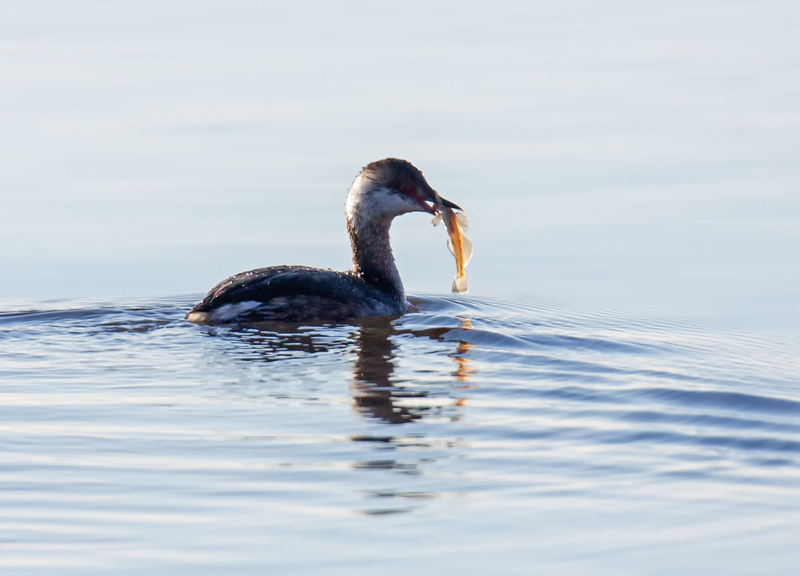 Earlier this week at Occoquan Bay National Wildlife Refuge I captured this image of what I an pretty sure is a Horned Grebe (Podiceps auritus). The subject was significantly backlit and is a bit dark, but even the most casual view will note that the bird has no horns. Well, only breeding adults have golden head tufts that someone decided look like horns. In any case, I really like how the warm orange of the skinny little fish contrasts with the overall bluish tones of the image. Needless to say, the fish was gone a few seconds later. Nice capture! The backlighting makes the fish even more translucent and accentuates its colours which then contrasts with the bird. Very nice. Wildlife is always about timing and skill. Both worked well here. Hi Mike, I hope you won’t mind me saying this. The ads on your blog posts seem to be multiplying – 6. in this one with images that really take away from the beauty of your own. It is a shame the ads are there. If you have a choice, your posts are far more enjoyable without them. Wow. Thanks for the warning and the alert. I guess I need to turn them off. I thought that the ads were set to show a single ad at the top of the page. Off they go! Thanks so much, Chris, for feeling comfortable enough to share your impression. Six ads on a page. Yikes!